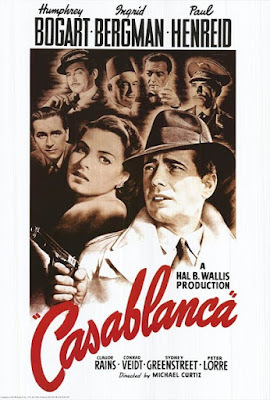 For this Valentine's Day, Corinne, Chris, Sarah, and Tim are putting it on 22 as they grab a drink at Rick's and enjoy the charms of 1942's Casablanca. Listen in as we discuss the political dimensions of this classic romance, note how the film helped shape Humphrey Bogart's onscreen persona, and explore whether Casablanca itself symbolizes purgatory amidst the chaos of World War II. Warning: Contains explicit language, spoilers, and baby gurgling. Are you looking to negotiate a fair price for an exit visa? Do you have any requests for Sam the piano player? Think this movie needs more poodles? Leave a comment and keep the discussion going.